Subaru of America announces pricing on the new 2019 Subaru Ascent 3-Row family hauler and in base trim Subaru keeps it just over $30,000. The U.S.-built 2019 Subaru Ascent available in base, Premium, Limited and Touring trim lines, starts at $31,995. Destination and Delivery adds $975. Here’s pricing and features on each Ascent trim. The Ascent base trim starts at $31,995 comes standard with Subaru Symmetrical All-Wheel Drive and X-Mode; EyeSight Driver Assist Technology; Subaru Starlink 6.5” Multimedia system with Android Auto and Apple CarPlay; four USB ports; three zone automatic climate control; power side mirrors; raised roof rails; second-row bench seat (8 passengers); 18-inch aluminum-alloy wheels with silver finish: 19 cup holders; multi-function display; and security system with engine immobilizer. Standard on all models is Auto Vehicle Hold which keeps the vehicle in position at a stop so the driver does not need to continuously depress the brake pedal. For the first time in a Subaru, a convex cabin-view mirror allowing the driver and front passenger to view occupants in the second and third row is standard equipment. Premium trim is priced from $34,195, adding Blind-Spot Detection with Lane Change Assist and Rear Cross-Traffic Alert; towing capability up to 5,000 lb. ; power driver seat; unique spill-repellent cloth upholstery; Subaru Starlink 8.0” Multimedia Plus system with Android Auto and Apple CarPlay; Wi-Fi connectivity; body-color side mirrors; privacy glass; leather-wrapped steering wheel and shift lever handle; rear seat climate controls; 18-inch aluminum-alloy wheels with gray machine finish; and the All-Weather Package with heated exterior mirrors, 3-mode heated front seats and windshield wiper de-icer. Limited ($38,995) includes all Premium trim features and adds leather-trimmed upholstery as well as second-row captain chairs or bench seating at no additional charge. Limited trims receive LED Steering Responsive Headlights with High Beam Assist, LED fog lights and new second-row retractable sunshades. Also, standard are 20-inch aluminum-alloy wheels in dark gray with machine finish. Additionally, lower door cladding with chrome accents and body-color side mirrors with integrated turn signals; driver’s seat adjustable thigh support; RAB; power rear gate with height memory; and Keyless Access with Push-Button Start are included. Two additional USB ports are added to Limited, to bring the total number to six. The top trim Subaru Ascent Touring is priced at $44,695. Touring model gets upgraded with satin silver side mirrors with integrated turn signals, chrome door handles, chrome front underguard and rear bumper protector. The unique interior features luxurious Java Brown leather seats and upholstery; upgraded leather heated steering wheel and woodgrain-pattern matte finish accent trim. Standard three-mode ventilated driver and front passenger seats enhance the comfort in the Touring model. A 120-volt power outlet and up to 8 USB ports are available for charging tablets, phones and laptops. The Touring adds the 8.0-inch Multimedia Navigation system, Harman Kardon Quantum Logic surround sound system with 14 speakers, panoramic power moonroof and rain-sensing wipers. To improve the driver’s view, a unique Smart Rear-View Mirror and a 180-degree front-view camera complete Touring’s comprehensive list of features. Manufacturer’s estimated fuel economy for the base and Premium models with standard equipment is up to 21/27 city/highway mpg and 23 combined mpg offering a 500+ mile cruising range. Models equipped with 20” wheels achieve manufacturer’s estimated fuel economy of 20/26 city/highway mpg and 22 combined mpg. The all-new 3-Row 2019 Subaru Ascent arrives at Subaru showrooms this summer. The pricing seems reasonable, does it take regular gas, that's the big question for me. 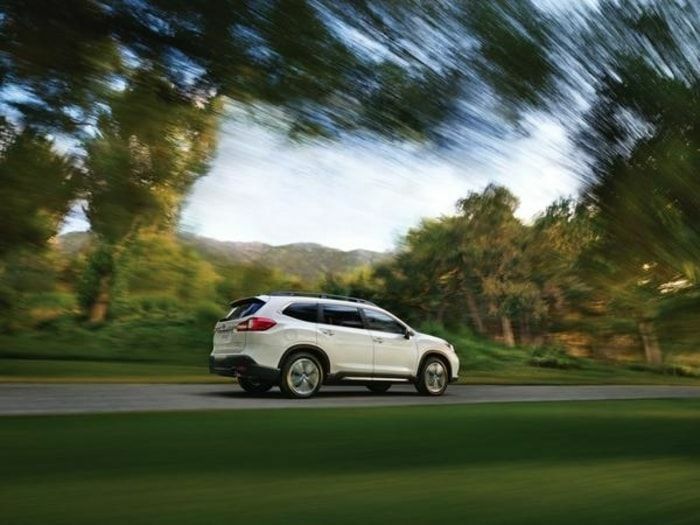 The Ascent uses Regular Unleaded with a maximum of 10% Ethanol per the owner's manual. One thing that wasn't mentioned is that the trailer hitch hides behind the panel in the bumper when the ball is not in place so it looks nice and invisible when not towing. Does it take Regular or Premium octane gasoline? I asked that same question at the Auto show and the rep said the new 2.4 L Turbo for Subaru Ascent does not require 93 octane. I've heard the Ascent will be available early summer. Does anyone have better info. Just ordered mine and delivery is July. Read one site that said it will run fine on regular, had a 2016 Kia Sorento , and it was regular with turbo. Now have a 17 Outback, and will probably upgrade to the Ascent, but want to see, and drive it first. So far the Outback with the boxer 4 does well for me, with 29 mpg in city, even dealer was impressed. what is the miles per gallon and how large is the gas tank? We currently have the Subaru Tribeca.